At the dawn of the sixteenth century, the republic of Venice reigned as one of the wealthiest and most powerful city-states in Europe. With the decline of the High Renaissance and mannerist artists in central Italy, Venetian painters assumed a position of artistic supremacy in Europe by 1540 that they would occupy for the rest of the century. The preeminent artist during this period was Tiziano Vecellio, called Titian. Born around 1490 in the town of Cadore in the Dolomite Mountains, Titian received brief training with the Venetian mosaicist Zuccato before he studied painting with both Giovanni Bellini and the innovative Giorgone. By 1510 he had established himself as an independent master. Following a succession of commissions for the courts of Ferrara, Mantua, and Urbino, Titian's fame spread internationally. His patrons included such prominent figures as the German Emperor Charles V, Philip II of Spain, Francis I of France, and Pope Paul III. After a brilliant career spanning more than sixty-six years, Titian died in 1576. The portraits and mythological subjects on this tour exhibit the sumptuous colors and rich painterly textures that characterize Titian's style. 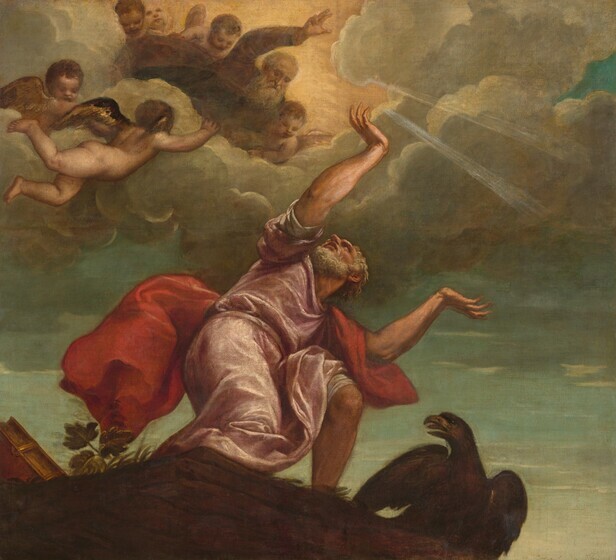 While his influence is clearly evident in the works of his Venetian contemporaries Tintoretto, Veronese, and Bassano, Titian's work also exerted a strong impact on Rubens, Rembrandt, Velázquez, and other artists of the seventeenth century. The son of a Venetian statesman, Pietro Bembo (1470–1547) is recognized as one of the most celebrated diplomats, poets, and humanist scholars of the sixteenth century. In 1513, after taking Holy Orders, he became secretary to Pope Leo X in Rome. Bembo was appointed librarian of St. Mark's Cathedral in 1530, and he became official historian for the city of Venice. 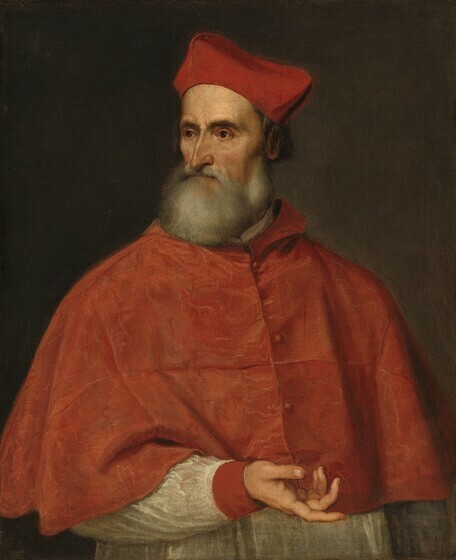 Titian probably painted this official portrait to commemorate Bembo's elevation to cardinal in March 1539. In this, his second portrait of Pietro Bembo, Titian portrayed his lifelong friend as an intelligent, dynamic individual. Bembo's dark eyes are bright and alert; his short gray beard is softly modeled. His angular features are somewhat idealized and give him the appearance of a man younger than his seventy years. Wearing the scarlet cape and biretta (hat) of his profession, Cardinal Bembo turns his head to the left while he gestures to the right. By aligning Bembo's right arm and hand with the edge of his cape, Titian gave this painted likeness the quality of a sculpted portrait bust, similar to those of Zorzi family members by Alessandro Vittoria. 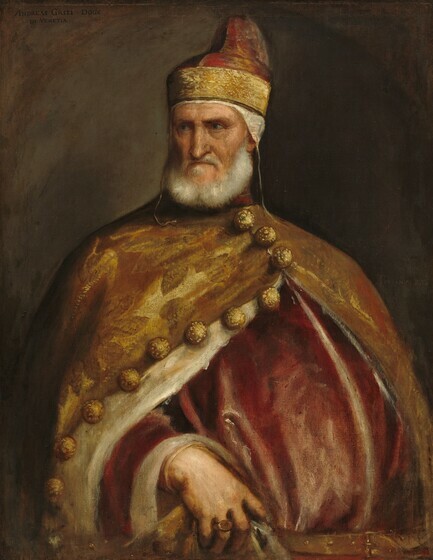 The patrician Andrea Gritti (1455–1538) was elected doge, or duke, of Venice in 1523, after having served the city as a military commander and diplomat. Renowned for his forceful personality and his promotion of the arts, Gritti remained an active civic leader until his death in 1538. 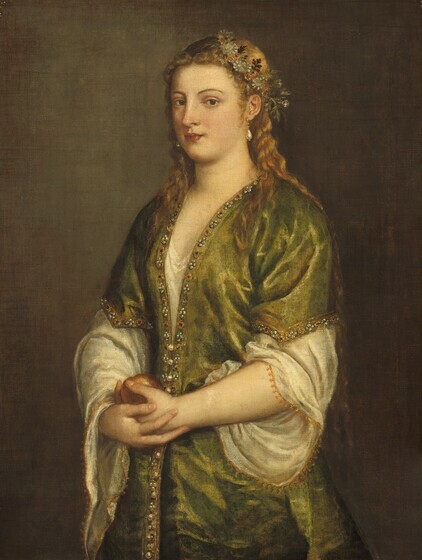 Titian painted Gritti twice during his reign. He completed this posthumous portrait, which might have been commissioned as a memorial by the doge's family, around 1546–1548. Dressed in the brocade robes and conical hat of his office, Gritti makes a grand impression. Glancing sternly to the viewer's left, he gathers up his cloak with his right hand and appears to stride forward, as if in a ceremonial procession. Titian further enhanced the monumental presence of the sitter by extending his image fully to the edges of the canvas. With its free, expressive brushwork, this portrait well exemplifies Titian's mature painting style. Because the canvas has never been flattened by the process of lining, the varying surface textures, such as the transparent red of the robe and the heavy impasto of the white fur and gold buttons, reveal the ways Titian applied his paints. The circumstances and date of this portrait of Ranuccio Farnese (1530–1565) are known from a letter dated September 22, 1542, and written by the humanist Gian Francesco Leoni to Ranuccio's older brother, Cardinal Alessandro Farnese. 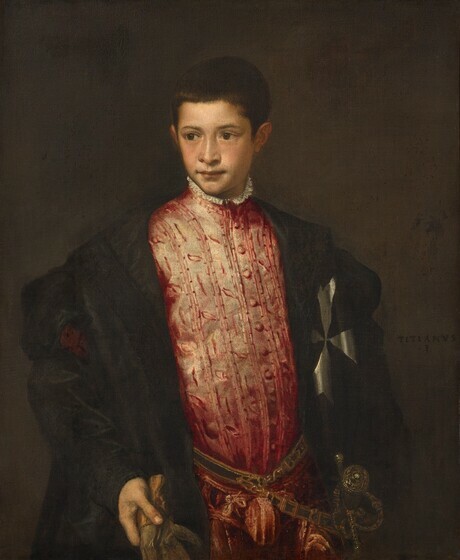 Commissioned as a gift for the boy's mother, this portrait of twelve-year-old Ranuccio was painted in Venice just after he had been made prior, or religious director, of San Giovanni dei Forlani, an important property belonging to the Knights of Malta. The grandson of Pope Paul III, Ranuccio was the youngest member of one of the wealthiest and most powerful families in Italy. He became cardinal of Santa Lucia in Sicily at the age of fifteen, and he was granted several bishoprics before his untimely death at the age of thirty-five. Engulfed in a black cloak emblazoned with the Maltese cross of his new office, the life-sized Ranuccio emerges from the dark background into the light. The luminous colors and shimmering highlights of his red silk doublet reveal Titian's signature technique of applying numerous layers of translucent oil glazes. In this perceptive portrait, Titian brilliantly captures the image of a sensitive young man about to embark upon a very public life. Perhaps one of the artist's favorite works, this canvas remained in Titian's studio until his death, and it inspired numerous copies and variations. Due to the painting's superior quality, this is the only version that is universally recognized to be entirely the product of Titian's hand alone without contributions from other painters working in his studio. 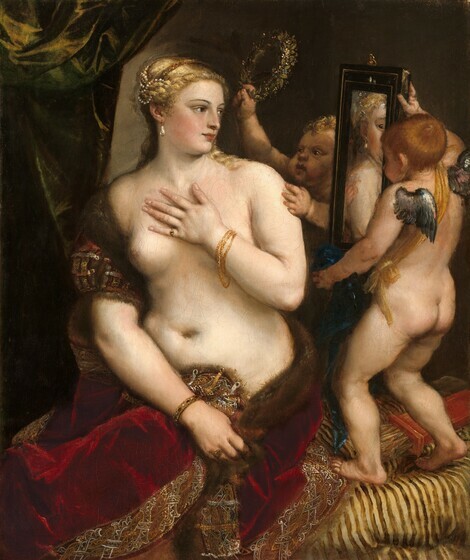 Venus with a Mirror is a visual feast of rich textures and sumptuous colors. Venus gazes at her reflection in a mirror held aloft by Cupid, while a second putto reaches up to crown her with a wreath of flowers. Raising her left hand to her breast, she draws her fur-lined robe across her lap with her right hand. The deep crimson color of the velvet garment beautifully complements the warm tone of her creamy flesh. The metallic embroidery and gleaming jewels provide textural contrasts to the softness of her fabrics, skin, and hair. The pose of Titian's goddess recalls that of the classical Venus Pudica. Titian may have seen this work of ancient statuary in Rome when he wrote that he was "learning from the marvelous ancient stones." More than depicting a mythological subject, Titian's painting celebrates the ideal beauty of the female form. Titian painted the first version of Venus and Adonis as one of a series of eight mythological subjects, which he called poesie, or visual poems, created for King Philip II of Spain. More than thirty painted and engraved versions of this extremely popular theme survive today. Some canvases, such as this one, were painted by Titian himself. Others were produced by members of his workshop, and still others were the work of later copyists. The story of Venus and Adonis derives from Ovid's Metamorphoses. Venus, infatuated with the handsome young Adonis, knew that his passion for hunting would ultimately cause his death. Here, the powerless goddess clings to her mortal lover in a futile attempt to save his life. Adonis pulls away to pursue the hunt and tragically meets his death. The closeness of the lovers' final embrace serves as an ironic reminder of their impending, and permanent, separation. It is odd to see Venus depicted as a vulnerable figure and from a rear view. Titian wrote that by posing her from behind, he hoped to provide variety among the many nudes in King Philip's collection. By painting Venus from the back, Titian also allowed viewers to complete her beauty according to their own ideal of perfection. For centuries artists referred to the Gospels of Matthew, Mark, and Luke for their depictions of Jesus' baptism in the Jordan River by his precursor John the Baptist. With his head lowered and his hands folded in prayer, Jesus stands in the river as John pours water over his head from a shallow dish. To the left an angel waits to clothe Jesus at the conclusion of the purification ritual. In the upper left, a flood of heavenly light suggests the voice of God, who declared, "This is my beloved Son, in whom I am well pleased."